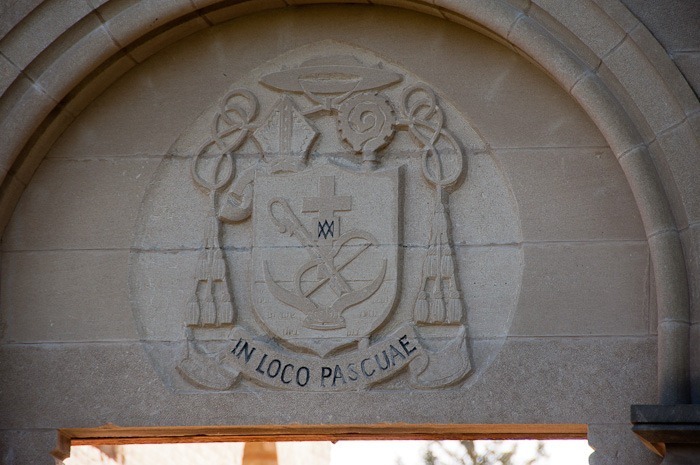 In 1892, Monsignor Ritchot, parish priest of St Norbert and Archbishop Taché of St Boniface invited five Cistercians of the Trappist order from the Abbey of Bellefontaine, France, to establish a monastery here. The Trappists were an independent branch of the Cistercian Order which began in Normandy after 1664. They strictly followed the basic tenets of St. Benedict: charity, obedience and humility. Religious persecution in France during the late nineteenth century forced many Trappists to leave Europe. Therefore the Trappists who came here had been in Quebec for some years already. Once they arrived in St Norbert the new community was named Our Lady Of The Prairies or Notre Dame des Prairies, in French. The first building was where the current Arts Center is located. In 1903-04 a Romanesque Revival church was built and the connecting monastic wing in 1905. After the first monastery building burned down, a guesthouse was erected in 1912 on its foundations. 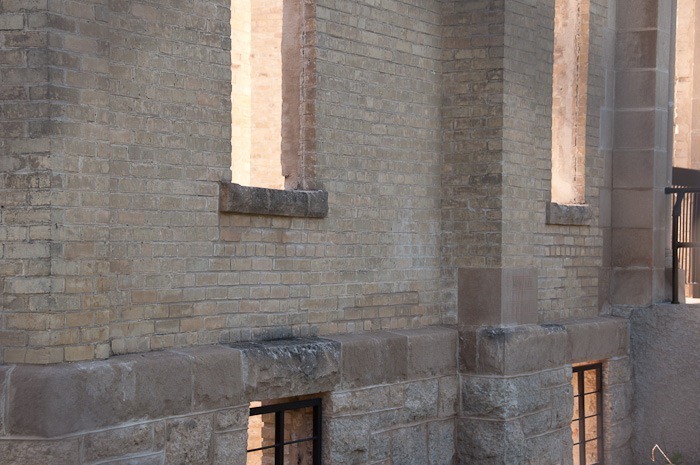 This self-sufficient monastery included milking barns, stables, a cheese house, apiary, sawmill and cannery. Between 30 and 45 monks inhabited the monastery at any given time. The Trappists were (and still are) a silence observing order. They value their silence and quietness and use it for contemplation and prayer. The neighbouring City of Winnipeg, however was growing faster and faster during the 1960s and 1970s. 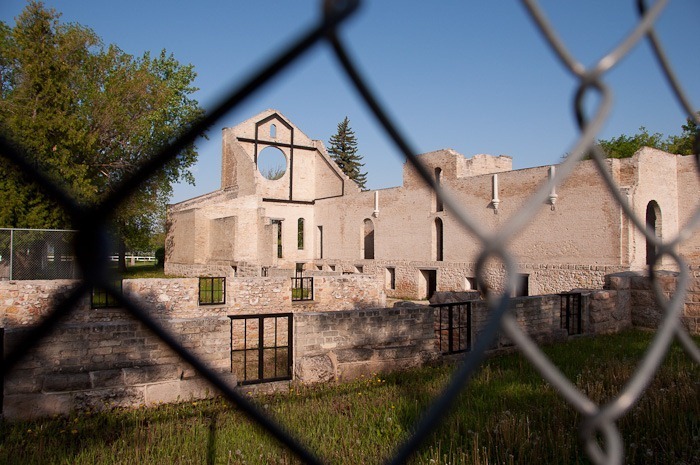 Winnipeg grew so much that by 1978, the Trappists had moved to a site near Holland, Manitoba, to protect their contemplative life from the effects of urban uproar. The land and the buildings were sold to a promoter and the monks moved out. 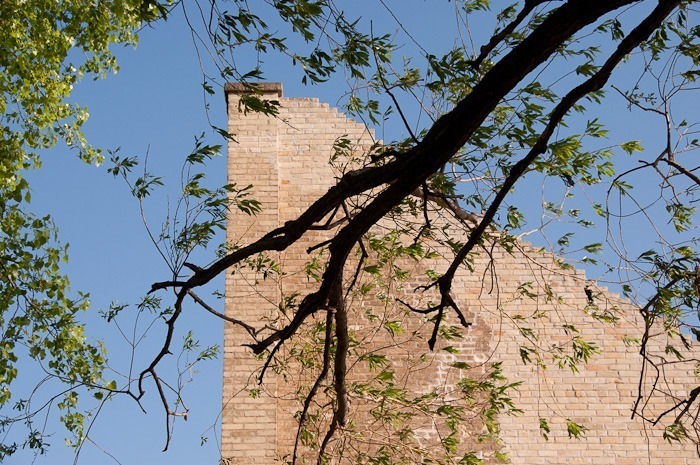 The buildings then fell into neglect and the land was simply kept unused. Probably waiting for bigger profits than were available at the time. 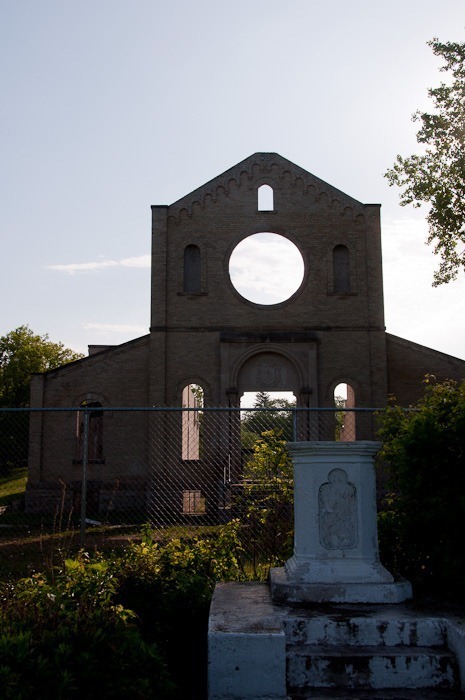 Five years later, the church was gutted by fire, lit by young vandals. 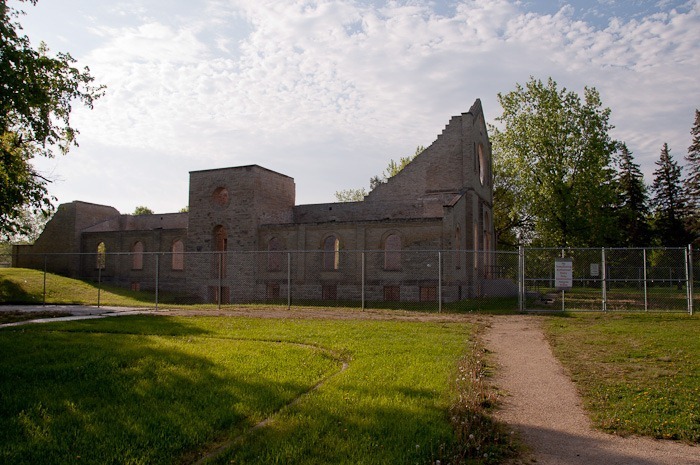 By then, many inhabitants of St Norbert rallied to get the grounds and the ruins back to life by buying it back. 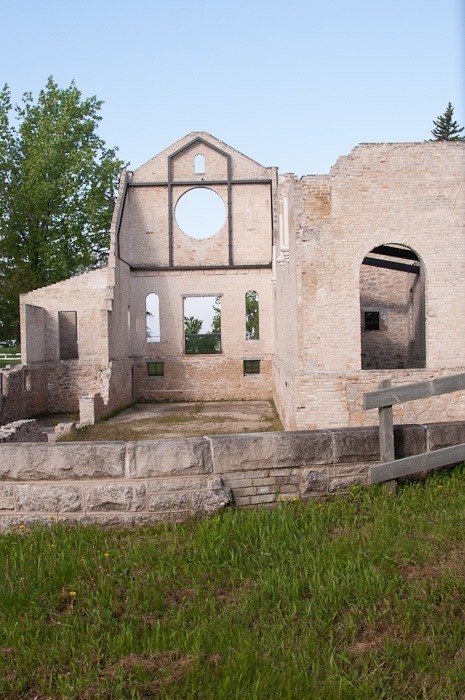 Subsequently the land as well as the ruins were classified Historic Site and Buildings. No further development could then take place here. The whole terrain is now a Provincial Heritage Park and anew breathes the quietness the Trappist Monks so desperately needed for contemplation. What is left of the ruins has been stabilised but they are still surrounded by a chain link fence. It is impossible to come close to the ruins and feel the atmosphere from the stone itself. I had to take pictures from a distance. The former guest house now houses the St Norbert Cultural Arts Centre, subject of a future post. In the mean time, a visit to the ruins can make your day a lot calmer. 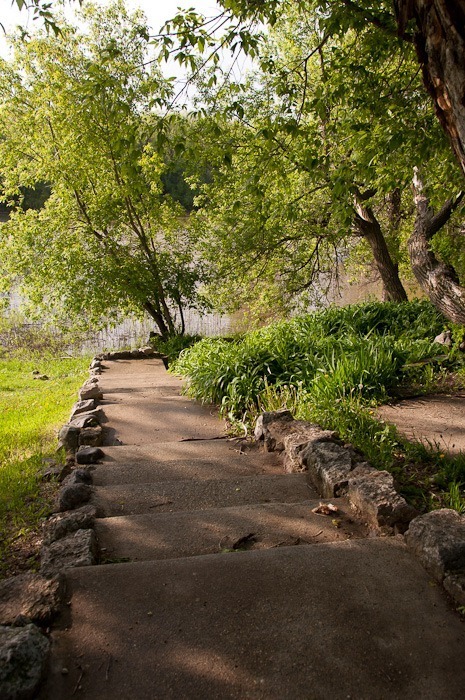 Get away for a few minutes from that hectic city life, then come back to work with a quiet mind. The place still holds that original power, try it.